‘Vixens’ is up – for free! At Lightspeed! – and I’ve got a bad case of the post-publication ennui setting in. I’m not sure what I was expecting, really. Writing is not a thing where you get a lot of feedback, unless you’re extraordinarily lucky and/or popular. That’s part of what makes it so tough. 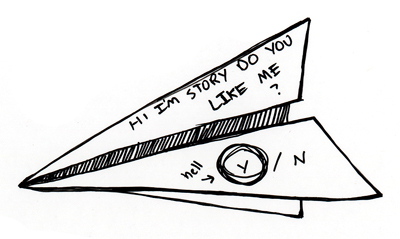 You tear a chunk of your brain out, fashion it into a paper airplane with HI I’M STORY DO YOU LIKE ME Y/N scrawled across one wing, and send it spiraling out into the world, where it promptly lodges itself in the gritty crawlspace beneath a stack of extra desks. That’s just how things are. The best cure, I find, is moving on to the next project as fast as possible. If you don’t have a next project, you bloody well make one. If you did read it and enjoy it, however, I am very, very happy, because that means it did what it was supposed to do. Stick around. There’s more where that came from (no, that was not a threat) and if you didn’t like this one, maybe the next will getcha. I’m tenacious like that. I just finished reading it. Lordie-loo, the imagery! The sweet, scrum-diddly-umptious imagery. Gave me goosebumps. I think ‘enjoy’ is an understatement. Oh man. I am so, so glad you like it. It has been too long since I told you how awesome you are, so here’s the daily reminder: you are awesome. Just read your story at Lightspeed. Loved it! Thanks! Glad you’re enjoying them! Well, for feedback: loved your piece at Lightspeed AND your piece at Strange Horizons, which is why I went hunting over and found your blog. The characters were strong and intense and the tornado’s personality was completely irresistible. Hope to read much more from you! Thanks! Stick around, hopefully there will be More Stuff very soon. Just wanted to let you know I really enjoyed your story on Lightspeed, I listened to it in audio, and out of the stories I have listened to on the website it is my favorite so far. Very well done, great characterization, a lovely sinister feel to every one of the heroes and villains, and visually interesting in my minds eye. The foxes remain vivid in my imagination. I hope you keep writing. All written works © Brooke Bolander. All rights reserved.